• Listen and ask questions about your problem, your general health, other medical care you are receiving or medication you are taking, and record this in your case notes. The information you provide will be confidential. • Examine you properly. It is likely that we will ask you to remove some of your clothing. Tell us if you are uncomfortable about this. You can ask a friend or relative to accompany you and be present throughout your treatment. • Examine the health of the joints, tissues, and ligaments using our hands and a highly developed sense of touch called palpation. We will also check for signs of serious conditions we cannot treat and we may advise you to see your GP or go to a hospital. We will provide you with a letter explaining what we believe to be the problem. The first session lasts one hour and the subsequent ones generally last up to 30 minutes but longer sessions are allocated if it is deemed necessary. We will give you a clear explanation of what we find (the diagnosis) and discuss a treatment plan that is suitable for you. We will explain the benefits and any risks of the treatment we are recommending. It is important to understand and agree what the treatment can achieve, and the likely number of sessions needed for a noticeable improvement in how you feel. This will become more apparent in due course as everyone responds differently. Treatment is hands-on and involves skilled manipulation of the spine and joints, and massage of soft tissues. We will explain what they are doing and will always ask your permission to treat you (known as consent). Ask questions at any time if you are unsure what you have been told or if you have any concerns. Self-help measures and advice on exercise may be offered to assist your recovery, prevent recurrence or worsening of symptoms. An exercise program comprising of videos will be emailed to you for your particular condition. Each treatment will start with a brief review of your symptoms and a reassessment to monitor your progress. Treatment will then consist of soft tissue techniques (massage), mobilisations, spinal manipulation and or a series of exercises that you will be guided through. Though treatment can be uncomfortable at times, it is our goal to help alleviate pain and restore function. During your initial consultation, we will outline a treatment plan and discuss the expected duration of treatment. Each presentation will vary significantly, however, most patients are expected to need no more than 4-6 treatments initially, following which, we will discuss the frequency of ongoing treatment with you if indicated. However, it is usually advisable to make an appointment with your osteopath on a quarterly basis, for regular check-ups and maintenance treatments. It is our goal to alleviate your pain as quickly as possible initially there may be some pain. However, some techniques may be uncomfortable, and you are encouraged to let your osteopath know if it is causing severe distress or discomfort so that techniques can be modified and an alternative approach can be taken. It is not uncommon for there to be an initial soreness or temporary worsening of symptoms after osteopathic treatment, though this should usually subside within 12-24 hours. This is known as a treatment reaction and often signifies the initial stages of healing. However, if this persists longer than 48 hours or causes you major distress, you should call your osteopath immediately to seek advice. Initial Consultation: £65 this includes a full case history, examination, and treatment. What about private health insurance cover? If you have private health insurance it may be possible to claim for your treatment. You will need to ask your insurance company about the available level of cover and whether you need to be referred by your GP or a specialist. You will find a list of insurance companies that we work with. Some insurance companies do not cover our full fees so regretfully we no longer work with them. We are registered with all major health insurers such as HSA, CIGNA and Norwich Union. Please check with your insurers for the level of cover you are entitled to under your policy. Is a referral from a doctor necessary? No, you do not need a referral from your GP most patients ‘ self-refer’ to an osteopath for treatment. Would I need an ongoing care? Because of the physical nature of the treatment, it is not unusual to sometimes feel sore in the first 24-48 hours after treatment. we will explain any likely reactions that you could expect. If you have any concerns it is important to contact the osteopath and ask their advice. It usually requires more than one visit before your problem is resolved. We will review your progress at each subsequent visit and seek your consent to any changes to your treatment plan. What is the leading cause of disability in nearly all high-income countries? Chronic back pain is now the leading cause of disability in nearly all high-income countries. In the U.S., more than 60% of people who see their physician for lower back pain are prescribed an opioid painkiller when most of the back pain problems can be resolved with osteopathic treatment. What are the clinic opening times? We do have private parking outside the practice on the driveway. How can I book an appointment? Can I book it online? 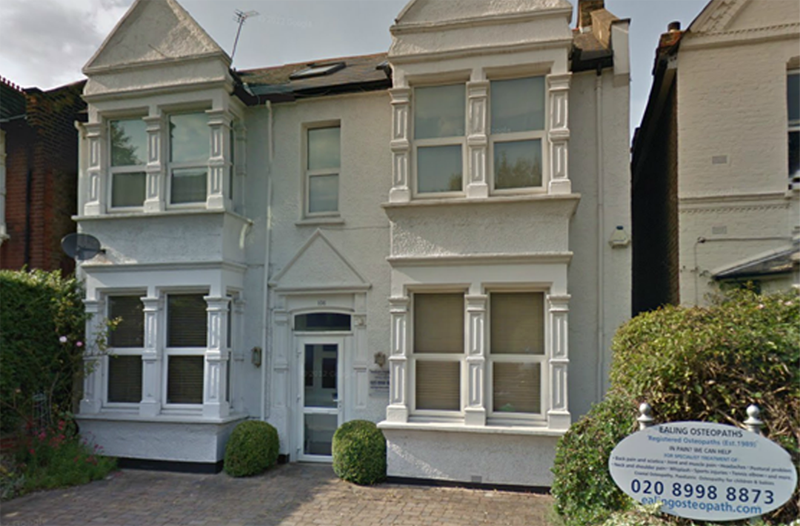 You can book the osteopathic appointment by calling us on 020 8998 8873 – there is an answering machine also if you want to leave a message and we’ll call you back. You can book an osteopathic treatment online. Or by emailing us. Where is your osteopathic clinic?